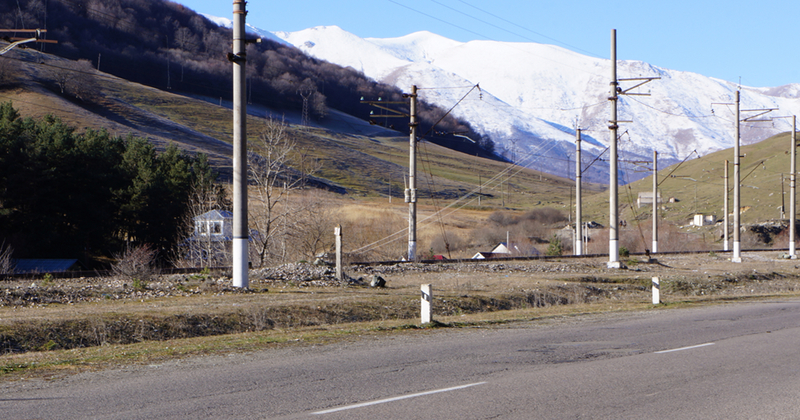 Set out today from Dilijan, -1°C, cool but clear and sunny. The walk today is to Vanadzor, 32km and (according to Google maps) a climb of 3250m, so chicken porridge for breakfast to start the day right. Yes it really is chicken in oats porridge, and doesn’t taste too bad. A nice day to be on foot. A few of my toes are wrapped in small-bubble bubble-wrap, stuck to my feet with duct tape (always carry duct tape!). No time for limping today. (In the evening when I took my socks off the bubbles had all burst – so no new product ideas here – but my toes were no worse, so perhaps the idea wasn’t among my 10 stupidest). 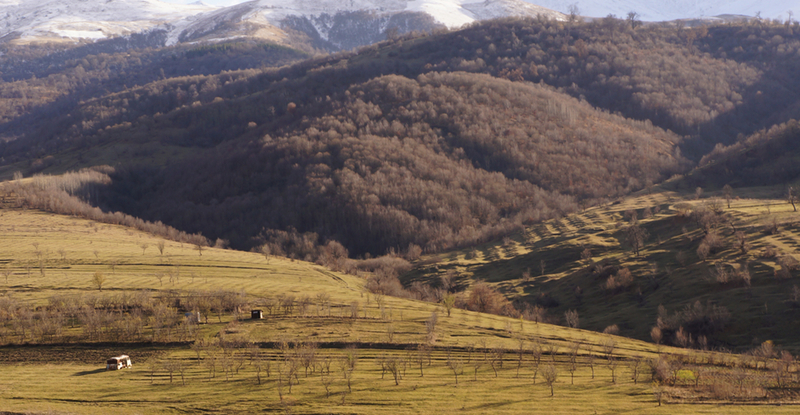 This is village country – small-scale farming, ploughed fields and grazing livestock. Along the way were women selling huge cabbages and sacks of potatoes and carrots, good thick soil still clinging to them. Cows and horses lunching beside the road. 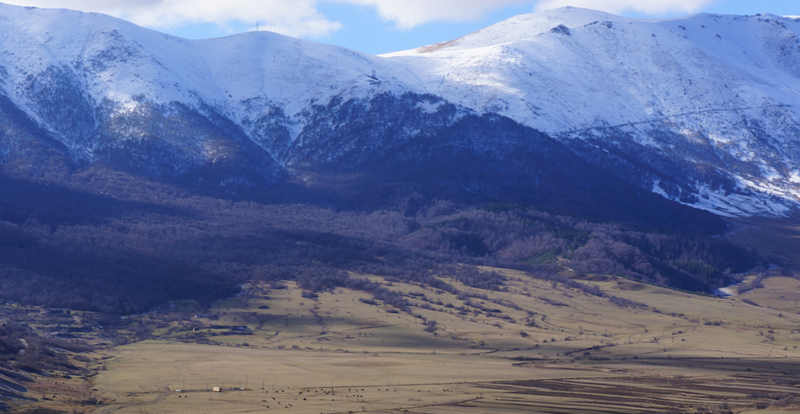 The fields were the green/brown of winter, and were surrounded by snow-covered mountains. Too late I discovered that while there were villages on the way, none of them were selling anything to eat, or anything at all, and even the raw cabbages were well behind me now. By Margahovit there was an icy wind off the mountain. Gloves on, hat on, hungry, cold. By Lermontovo I was more than 1/2 way and the road had been all uphill so far. Nothing to eat here either, unless I run down a cow and cook it myself. Unfortunately running down animals and eating them is a life-skill my parents failed to teach me. By Shaumyan the sun was starting to go behind the mountains and the sweet smoke of wood fires was rising from stone houses. Anyway, I drank 2 bottles of it, and as Mr Priestly might have put it, ‘felte greately refreshed’. Arrived at my evening’s B&B as the sun was setting. Wow…that’s a very long and tough walk. Glad you made it! yes, well, so am I. Anyway, it wasn’t dangerous there, just a bit long and cold. But worth it. Where the heck are you? Too lazy to Google and Wiki. Helloooo? I don’t recognize any of these place names! Am in Estonia at the moment, but this is an post from last year, from Armenia. I rotate a few old posts through the Featured slider. About once a week I change one or two posts in the Featured slider. I use it becuase there are some old posts that I like that I don’t want to just die in the Archives bin. You have just made me realize a disadvantage of the Featured slider is it doesn’t show dates. You can see the date at the bottom of the post – “events 27 Nov 2012”. But this could cause confusion. Will have to think about this.